In the editorial of issue 20 of Whisky Magazine, Marcin Miller asked whether there is a link between pure dog breeds and single malt whiskies (with mongrels being equivalent to blends). Marcin contemplated that his dachshund would be a Tamnavulin, because of the ‘short legs’, the ‘lightly scented and floral nose’, the ‘notes of drains, brackish water and farmyard’ and the ‘very, very, very long finish’. When I first read this idea of matching the characteristics of dog breeds with those of single malts, I felt it was a light-hearted joke. But the matter sort of kept nagging at the edge of my conscience until I saw an article in Science. In this article, the authors investigate the origin of dogs and present evidence that suggests that dogs evolved from wolves more than once and that this may have happened much longer ago than previously thought: over 100,000 years ago instead of 14,000 (for anyone interested, the full reference of the article is: Vila et al, 1997. Multiple and ancient origins of the domestic dog. Science 276: 1687-1689; a pdf-file of the article is available from me in case people are interested). Included in the article is information on the genetic relationship between 67 breeds of dog. 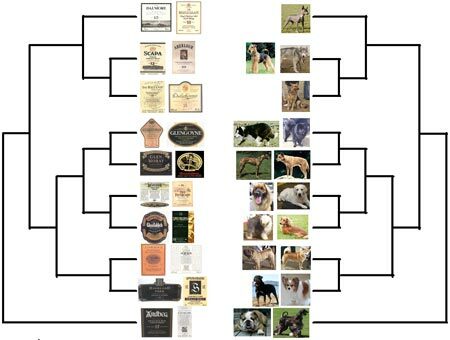 So here it is: the connection between pure breed dogs and single malt whiskies, backed up by what is, without a shadow of a doubt, the most thorough scientific investigation of the subject. David Wishart’s ‘tree’ on the left, the dog ‘tree’ on the right, with each of the whisky or dog clusters represented by one or two single malts or dog breeds, respectively. Linked to the cluster with Glenmorangie and Oban, characterised by spicy notes, we find a dog cluster with several oriental breeds such as the shar-pei and the shiba inu. Obviously, we’re looking at oriental spices here. The peat monsters are all included in the bottom cluster (J in David Wishart’s analysis). Linked to them is for instance the English bulldog. Not hard to see this link between two heavy-weights; obviously, bulldogs are the peat monsters of the dog world! And I can also see the match between the less peaty malts in this cluster, such as Clynelish, and an elegant breed as the Afghan hound. And what about Marcin’s dachshund, which started all this? The dachshund is in the dog cluster which links to a whisky cluster with sweet and floral notes (such as Glenfiddich and Speyburn). So yes, Marcin was right about the floral notes of a dachshund (! ), but not about the link with Tamnavulin which is clustered together with the more spicy malts. Thanks to Marcin Miller for providing the inspiration for the research presented in this article.